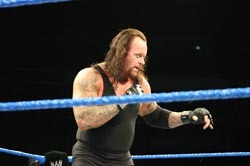 The WWE SmackDown Road to WrestleMania 22 tour event which took place at Westpac Stadium this past Saturday has proven to be a roaring success for all involved. Westpac Stadium Marketing Manager Steve Thompson puts the SmackDown event up there as one of the best shows the facility has hosted. “It was one of the best events that has ever been held at the Stadium and we rate it along side the International Sevens as an event that we are extremely proud to host this summer. Mr Thompson went on to say that the WWE Superstars were amazed at the size of the venue and the ring-stage setup when they first entered the Stadium. “Holy Cow, this is a coliseum, not an arena,” was one of the WWE stars’ comments. “After the reception they received from the fans they are very keen to come back to NZ,” Mr Thompson said. “It was one of the most hyped and best behaved crowds we have ever enjoyed hosting and I would like to thank all the fans who traveled from all over the country and helped make it such a special night.